Elegant appetizers can be so much fun but they don't surface very often. They just bring such a different feel to a party than chips and salsa or pigs in a blanket. And the cost doesn't have to be out of control if you find the right combination of ingredients. This post happens to be about my sister's creation and it fits the bill for being easy to prepare and it's not too shabby on the budget either. She had a Super Bowl party at work yesterday and needed to bring a dish. After brainstorming, she came up with the great idea of Caprese Skewers. 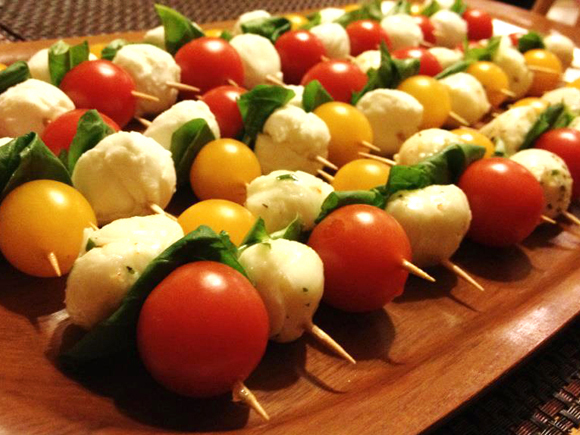 If you're familiar with the term caprese, the skewers are pretty self-explanatory. If you've never heard of caprese before or aren't sure what it is, in it's simplest form it is a salad made of fresh, sliced tomatoes, fresh mozzarella slices, and torn basil leaves that is drizzled with extra virgin olive oil. There have been many modifications to the original dish and many variations based off it, but these little bites have to be the truest in caprese bite-size form. The skewers are simply toothpicks that have one red or yellow cherry tomato, one fresh mozzarella ball, and one basil leaf in between. My sister made different variations by using marinated mozzarella balls on some instead of the plain, too. They're beautiful finger foods that bring a classy flare to the appetizer table. If you're a fan of simple, Italian food at it's purest, I'd definitely suggest giving these a whirl.